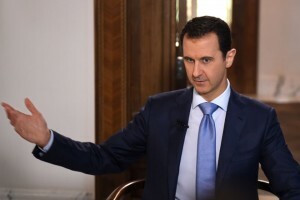 President Bashar al-Assad affirmed that the majority of international reports about Syria are politicized, incredible and financed by the Qataris and Saudis. President al-Assad added in an interview given to Netherlands NPO2 TV that the western policy towards counter-terrorism file is not objective and not stable. Question 3: Now, roughly 4,000 Syrians flee your country every day, 4.3 million up to date, and you must hear some of their stories, why they are leaving. How does it make you feel if you hear that? President Assad: They are sad stories. It’s about the hardship of every single person, every single family. We live with these stories on a daily basis, as you mentioned. But it’s not enough to feel; what can we do? They left because of the terrorist attacks, direct attacks, because the terrorists attacked the infrastructure, and because of the Western embargo that led to the same target of the terrorists, directly or indirectly. I think most of those are ready to go back to their country. They still love their country, but living in Syria could be unbearable for them for different circumstances. Question 4: You say most of them are ready to come back, but from many stories they tell, they flee from terrorism, of course, but a lot of them flee from your government, your armed forces, as well. President Assad: You are in Syria now, you can go to the areas under our control. You can see that some of the families of the terrorists or the extremists or the militants, whatever you want to call them, live under the supervision of the government and the support of the government. So, why didn’t those families leave Syria? Question 5: Okay, while we hear stories in the West of Syrians coming here, they talk about torture, widespread, people in prison, things done by your armed forces. That’s the reason why they leave. Is there truth to their stories? President Assad: Let’s talk about the facts. The facts will tell you if it’s true or not. If you are torturing your people, attacking, killing, and so on, and you have the enmity of Western governments, the strongest countries in the world, the richest countries like in the Gulf, like Turkey, our neighbors, are against me as president or against the government, how could you withstand for nearly five years in such circumstances if you don’t have public support? And how can you have public support if you are torturing your people? I mean, if you have mistakes in reality, that could happen, that would happen anywhere. Question 6: So there are mistakes? President Assad: Of course, especially when there is war, you could have a single mistake committed by a single person, that would happen. You have chaos, sometimes that would happen, we don’t exclude this. But there’s a difference between having this kind of mistakes and having a policy in order to torture your people and lose their support. Question 7: You say there is no such policy? Question 8: Because today, Human Rights Watch, and the UN before that, came out with a report saying there’s widespread, as they call it, “death and dying in detention centers, since the uprising in 2011.” Is there any truth to that? President Assad: If you want to verify the credibility of those reports, to say that they’re not politicized, they’re not talking about one side of the story. You mentioned the shelling of Damascus a few days go, and that happens every few days, killing many civilians, innocent civilians. Did they mention anything about this in the reports? You have many pieces of evidence that’s been published by the terrorists on the internet, photos, videos, about torturing, about killing, about beheading. Did they mention those stories? Question 9: So it’s one sided? Even the UN? President Assad: Of course, definitely, it’s politicized. Even the UN, it’s controlled by the United States, and the United States is against Syria. This is the reality, everybody knows it. Question 10: But you are part of the UN. Syria is part of the UN family. President Assad: Of course, but the UN is a biased institution because it is under the control of the United States and its allies. Question 11: And so, you say reports about widespread torture, human rights violations after 2011, those are biased, not true? President Assad: They are based on stories. Stories, you can pay anyone to tell you any story, like the Qataris are doing this. They publish many reports financed by the Qataris, by the Saudis, this means nothing. You want to make investigations, come to Syria. You have reality, it’s obvious. Question 12: They say it’s difficult to come to Syria and doing independent investigation. President Assad: No, it’s not difficult. You are here, so anybody could do the same. Otherwise, if it’s difficult for them to come, it’s going to be difficult for them to judge the situation and to make reports. Question 13: Moving on. As you know, we are from Holland, from the Netherlands, and my country is bombing ISIS just across the border here in Iraq. They are fighting the same enemy as you are. Would you consider the Netherlands an ally? President Assad: It depends on the real intention. What do you mean by fighting terrorists? Is it just because ISIS came here? Is it because you are afraid of their influence or effects in your region? If the incentive is fear, no, we’re not allies. Question 14: You think the incentive is fear? President Assad: Yes, not values. Because why didn’t they fight terrorism from the very beginning, before ISIS appeared? You had al-Nusra, you had Al Qaeda, you had many terrorists. You didn’t fight. Only this fight on terrorism started to appear when there was September 11 in the United States, the recent attacks in Paris, and in different European countries, but before that they didn’t say we are at war with terrorism. Question 15: So you mean they are late? They’re late to the party? President Assad: It should be a matter of principle. When it’s a principle, it should be sustainable, not what you call a kneejerk reaction when something you want to do it just as a reaction to something. So, it’s not principle. Fighting terrorism should be a stable, sustainable principle. This is the way we can be allies. Question 16: So you say, in our case, Dutch bombers over Iraq bombing ISIS is a kneejerk reaction? It’s not sustainable? President Assad: It is part of European politics and European politics is part of the American, it’s not independent. Everybody knows this. So, I cannot judge only Dutch politics as an isolated case; it’s part of this, and all this, let’s say, Western politics regarding terrorism, is not objective, and not realistic, and actually not only not productive; it’s counterproductive. Question 17: Right, because, you would say, well, you would say they’re bombing your enemy, so, well, they’re helping in some way. President Assad: Because when you don’t have the real intention and the realistic vision, the result will be in the other direction. You’ve been bombing, maybe you had intentions. Maybe, I mean, the politicians in your country, have good intentions, but what is the reality? Question 18: So bombing is not working? President Assad: It’s not working. You cannot fight terrorism without troops on the ground, and without a real incubator, a social incubator that supports you in your war against those terrorists. Question 19: So you say, bombing like the Dutch are doing, is for show? President Assad: Maybe for show, that depends on the intention. But in reality, for nothing, let’s say, for no avail. Question 20: Our government is, next month, deciding whether or not they will start bombing in your airspace as well, bombing ISIS targets in Syria, and as they are debating this, what would you tell them? President Assad: This is illegal. This is against the international law. We are a sovereign country. If you are serious about fighting terrorism, what is the obstacle for that government to call the Syrian government, to say “let’s cooperate in fighting terrorism?” The only obstacle is that the Western policy today towards Syria is “we need to isolate this state, that president, so we cannot deal with him.” Okay, you cannot reach anything then. Question 21: So you say it’s illegal if the Dutch bomb? They should ask your permission, that’s what you’re saying? President Assad: The Syrian government’s permission. Question 22: Have they ever been in touch with you about any of this? President Assad: No-one of them, no-one. Some European governments send their intelligence in order to make a kind of cooperation, security cooperation, regarding terrorism, because they are afraid of the terrorists. Of course, we refused. Question 23: Because they say there’s a mandate for it, because Iraq has asked for help, and now we can bomb in Syria as well. President Assad: No, they cannot, they don’t have the right, this is illegal, in every sense of the word illegal. Question 24: Now, moving on as well, the Netherlands, for what it’s worth, as you were saying, the Netherlands are also saying if there should be sustainable peace in Syria, that has to be without you. There might be a transitional period, but in the end, it can only be without you. What would you say to a statement like that? President Assad: If you accept as a Netherlands citizen that somebody in Syria would tell you who’s going to be your Prime Minister or not, we would accept it. But you don’t accept it, and we don’t accept it. As you say, we are a sovereign country, whether they have a good president or bad president, this is a Syrian issue, it’s not European. The Europeans have nothing to do with such a thing. That’s why we don’t respond. We don’t care about it. President Assad: No, no. This is a Syrian issue. The Syrian people would say who’s going to stay or not. If the Syrian people doesn’t want me to stay, I have to leave right away, today. Question 26: One more question about Holland and our neighboring country Belgium. Hundreds of wannabe Jihadis come here to Syria. Why are they coming here, what are they looking for? President Assad: The most important question is: why did you have them in Europe? Coming, that’s natural; when you have chaos, when Syria has been turned into a hotbed for terrorism because Europe and Turkey and Saudi Arabia and Qatar and those countries supported terrorists in different ways, of course you’re going to have chaos, and it’s going to be a nexus for terrorism. That’s natural for this, how to say, fertile soil, to attract terrorists from the rest of the world. But the question: why did you have them in Europe? You didn’t deal with terrorism in a realistic base. Question 27: So what did Europe do wrong in dealing with them? President Assad: I think it’s about two things, if you ask me about why. First of all, the European governments didn’t do their job to integrate these people in their societies; they lived in a ghetto. When you live in a ghetto, you’re going to be an extremist. The second one, many European officials have sold their values for the petrodollar, and they allowed the Wahabi Saudi institutions to pay money and to bring this dark and this extremist ideology to Europe, and that’s why now you are exporting terrorists to us. We don’t export, actually, they came to Syria, and then they go back to Europe. Question 28: They come back to us. President Assad: And the three criminals who committed the attacks in Paris, all of them lived in Europe; Belgium and France and others. They didn’t live in Syria. Question 29: Now, internationally, the United States always said “President Assad has to go.” Even yesterday, Secretary Kerry said, “well, maybe not immediately, and we’re not looking for a regime change.” Even the French are now saying the President may be part of a solution. Your luck seems to be changing. President Assad (sarcastically): Thank them for saying that; I was packing my luggage, I had to leave, now I can stay. We never care about whatever they say. They’ve been saying the same for four years now. Did anything change regarding that issue? Nothing. So, this is a Syrian issue, whether it’s Obama or the United States or Europe or any country, we don’t care about it. As long as the Syrians want this president or any other president to be in power, he will be there. So, to say that that he’s leaving now or leaving in six months or six years, it’s not their business, very simply. Question 30: Okay, but it might help in negotiations, some sort of peace, their attitude towards you. President Assad: This is not the issue. That depends on the problem that we’ve had in Syria. It has many aspects. What’s the relation between this president or any other president to be in power and ISIS and al-Nusra and Al Qaeda coming to Syria and terrorists killing and beheading? There’s no relation, so this is just to mislead the public opinion, just to say that the problem is in Syria is the president. So, who’s more important, the president or the country? Of course the answer is the country, so the president has to leave. So, this is the equation that they’re trying to promote. The only equation for the president is the public opinion in his country, like your country, like any other country. Other than this, if they are serious in solving the problem in Syria, every European official just trying to deliver homilies that could be suitable for church and for mosque, not for politicians, they have to go and work to stop the flood and the flowing of terrorists and the money and logistic support, armaments, through Turkey. That’s what they have to do. Question 31: Turkey is the key in all of this? President Assad: Of course, this is the logistical key. Of course, Saudi Arabia is the other key, with their money and their ideology. Question 32: Well, coming to that, you say there’s Turkey, Saudi Arabia. Internally, if there is – because there are three different initiatives to come to some sort of peace process – what would be the parties you are willing to negotiate with? President Assad: Any person who holds armaments and kills people and destroys public and private properties and so on, he’s a terrorist, so we don’t, as a government, we don’t make negotiations with the terrorists. Question 34: But the problem in this whole conflict is that everybody does that. President Assad: Exactly. So, how? How to deal with this situation? Because we are very realistic and pragmatic, we made negotiations with groups of militants, not organizations; we don’t recognize them as legitimate, to say we are making negotiations about the future of Syria. All of them are terrorists, and they don’t have any political agenda, by the way. We made negotiations with a group of those in order to go back to their normal lives, to give up their armaments, and to have amnesty, and it worked, and this is a real solution on the ground now. It’s moving from area to area. Question 35: Because, as I said, all the parties are involved in shelling, killing, your government as well. How about international parties, because they are involved in this conflict as well. Who would you be willing to talk to? Is it the United States, Saudi Arabia, Turkey, or just Iran and Russia? President Assad: We are talking to everyone who wants to help in solving the problem. We don’t have a problem about talking. The question is who is ready to deliver? That is the question. Question 36: And who is ready to deliver? President Assad: None of them, only Russia and Iran and their allies, and the other countries that support politically the Syrian government or the Syrian legitimacy, but not the West, no-one in the West is ready, few countries are ready, because they don’t dare to make contact with Syria to solve the problem unless the United States wants to impose its agenda on them and on us. Question 37: But in the end, you would have to negotiate with as many parties as possible. Would you be willing to negotiate with parties whose aim it is to have you removed, in the end? President Assad: Of course, of course. I mean, their way, if they want me to go, they have the ballot box. We are ready, we don’t have a problem. They can convince the Syrian people that there’s a better alternative, this is not an appropriate choice for the future, and the president will leave. We don’t have a problem. Question 38: That sounds really good, but in practice, realistically, in Syria, if you see the history of Syria, how much freedom do opposition parties have? How much freedom do politicians have to criticize you or to rise up against you? President Assad: Let me be objective; we’re not Europe yet, and this is a cultural issue, it’s not only political. But we are on the way for more democracy in Syria. We are moving slowly but surely. It’s not something related to the president, because Syria is not my company; it’s a country, it has people. I mean, the process of democracy is a social process, and political at the same time, so we’re moving forward. Question 39: But, one could say that four years ago, there was a step in that process of people rising up, and there was a brutal crackdown. President Assad: How many? How many rose up? Do you have a number? The majority of the number, in one day, in Syria, at the beginning of the crisis, was 130,000, let’s make them double, 300, double them again, 600,000. It’s nothing out of 24 million Syrians. Question 40: So you’re saying nobody really has risen up against you during those day? President Assad: No, no, you have of course, but it was a mixture between people who really wanted to demonstrate against the political system that they don’t believe in, you have people who have been paid by Qatar in order to demonstrate for the propaganda, and you have the terrorists who have been infiltrating those demonstrations in order to kill the policemen in order to retaliate. That’s what happened in the first week of the crisis. Question 41: So that’s only what happened? The police retaliated on killings that were done from within the group that was protesting? President Assad: The first week, we had many policemen being killed by the demonstrators. Who are they? Peaceful demonstrators, of course you had machineguns and you had everything from the very beginning. So, that’s what happened. Anyway, the president, if he wants to leave, he will leave through the constitution and ballot box, and if he wants to come, he will come through the constitution and the ballot box, and both will reflect the public opinion. Question 42: Has there been credible opposition in the last years, credible people who challenge you? President Assad: We have, yeah. We have opposition. You can meet them, they are in Syria, they live in Syria, they have grassroots, Syrian grassroots, big, small opposition, new, old. I mean, this is not the issue, but we have them, they are allowed. Question 43: Because we in the West would think, well, what we have seen in the media, all kinds of media, brutal crackdown, and now a war where there’s stories of barrel bombs, of massive incarceration, of extreme government violence. One would think twice before they would oppose or criticize you. President Assad: The question is what means would you resort to when you have people killing police and destroying and burning for the first days? It didn’t happen six months later, like the propaganda in the West tried to promote, that the peaceful demonstrations turned into armed actions just because of the crackdown. That’s not true. Again, they killed the policemen in the first week. Question 44: Looking back, what would you have done differently in 2011, what would you have done differently now? President Assad: The two things we have based our politics on are two pillars, are dialogue and fighting terrorism. Today we are going to keep fighting terrorism and we are going to continue the dialogue with every involved party in Syria. Question 45: Even if there will be an uprising like there was in 2011, you would react the same? President Assad: If the same happens, people killing police, we have to respond. That’s our job as a government. President Assad: I cannot judge myself because I am not going to be objective talking about myself, I mean, the Syrian people would say the president did enough or not. At the very beginning, you mentioned the crackdown; many people said the president didn’t do enough to crack down on those terrorists. This is versus what you mentioned, and that has been published in the West. So, if you want to be objective, all of us as Syrians, to judge this situation, it should be at the end of the crisis, because the end result will tell you about the beginning. Now we are still in the middle, it is not enough to talk about this. President Assad: Yes, of course, and that changes every day. Sometimes you judge the same action in two different or three or four different ways every day, because we live with a very quickly changing situation, your mood, and thinking; you’re influenced by all these things on daily basis. So, you may change, but no one of them will be concrete and absolute unless you overcome this crisis. This is where you can think more objectively and realistically about your actions as a president. Question 48: Last question: how long will this take before it’s resolved? President Assad: If the responsible countries take actions against the flood and the flowing of terrorists and the logistic support, I can guarantee that it will take less than one year. Question 49: Less than one year? President Assad: Less than one year. But the problem is that they are still supporting them on daily basis more and more in order to make it more messy, and to put obstacles in front of any solution, because they want the solution, what they called a political solution, to be ended with the changing of this state, getting rid of this president or depose him, and so on. So, that’s why it will drag on. Question 50: So, if it were without outside influence, you’d be done in one year. President Assad: Definitely, for one reason because the terrorists in Syria, they don’t have the social incubator yet. That’s why we do not worry about them. Journalist: Mr. President, thank you very much. President Assad: Thank you for coming to Damascus.